Yemen's rebel Houthi movement says a senior political figure has been killed in a Saudi-led coalition air strike. Saleh al-Sammad, head of the Supreme Political Council, was "martyred" in the city of Hudaydah last Thursday, the group's overall leader announced. 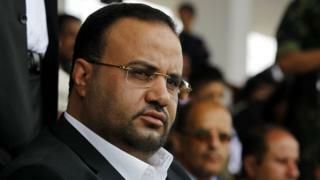 Abdul Malik al-Houthi declared that Mr Sammad's killing was a crime that "will not go unanswered". There was no immediate comment from the coalition, which is backing Yemen's government in the country's civil war. But Saudi-owned Al-Arabiya TV cited sources as saying Mr Sammad was killed in an air raid in the al-Buraihi area of Hudaydah province. The news came hours after rebel health officials said at least 20 people were killed in a coalition air strike on a wedding party in Hajja province on Sunday night. Meanwhile, two ballistic missiles - fired by the rebels at an oil facility the southern Saudi city of Jizan - were shot down, Saudi state media said. Mr Sammad is the most senior Houthi official to have been killed since the Western-backed coalition intervened in Yemen in March 2015, when internationally-recognised President Abdrabbuh Mansour Hadi was forced to flee the country. He was second on the coalition's most-wanted list, and a $20m (£14m) reward had been offered for any information that led to his capture, according to Al-Arabiya. Mr Sammad had been the chairman of the Supreme Political Council since its creation in August 2016. In rebel-held areas, the council undertook the responsibilities and functions of the state, including the formation of a government, the appointment of governors, and the issuing of governmental decrees. In a televised address on Monday evening, Abdul Malik al-Houthi said Mr Sammad was killed alongside six members of his entourage after meeting local notables at Hudaydah University, near the al-Ittihad Palace Hotel, in Hudaydah city. "He was targeted by US-Saudi coalition warplanes in three air strikes. He died, may God forgive him, proud, resilient, dignified, principled and brave," he said. "The forces of aggression, led by the US and the Saudi regime, bear the legal responsibility for this horrendous crime, as well as any consequences following it," he added. "This crime will not go unpunished, not this one, not others against our proud Yemeni people." Al-Masirah reported that the Houthis had named Mahdi al-Mashat, the former director of Mr Houthi's office, as acting chairman of the Supreme Political Council. Rajih Badi, a spokesman for the Saudi-backed Yemeni government, told Al-Arabiya that Mr Sammad's death was a "big blow" for the Houthis because of his political background and ability to form alliances. Analyst Peter Salisbury wrote on Twitter that Mr Sammad's death and Mr Mashat's appointment were seen as a "consolidation of power for 'hard-line', more militaristic elements" inside the Houthi movement and for Mohammed Ali al-Houthi, head of the rebel Supreme Revolutionary Committee. More than 5,970 civilians have been killed and 9,490 injured in Yemen over the past three years, according to the UN.